Special thanks to Crown Valley Coaches Dave Mickle and Rafaella Suarez for helping to make this happen. Crown Valley Divers of Laguna Niguel, California traveled to Georgia Tech University in Atlanta, Georgia last month for the AAU National Diving Championships 2014. CVD had 29 Divers compete against 59 teams from across the United States. CVD had 20 Divers place in the top 12 in their respective event, and 3 Nationals Champions: Joey Winkler, 16 year olds 3 meter. Jaclynn Fowler, 14 year olds 1 meter. Kaia Bray, 9 & Under 1 meter. 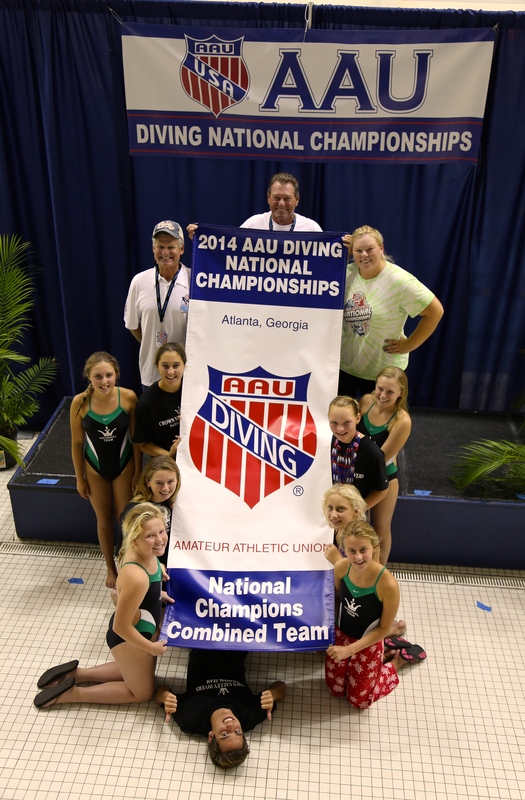 This was the second year in a row Crown Valley Divers won the AAU National Championship. They also won the Men’s division and the Women’s division. Ally Caplan, of the Crown Valley Divers in Laguna Niguel, wins double gold at the 2014 USA Diving Junior West Nationals held at The Riverside Aquatic Complex this past weekend, April 25-27. In probably the toughest age group, the 16-18 age group, where the majority of the contestants are less than a year away from representing the NCAA Division 1 University or College of their choice, Ally put in a tremendous performance of consistency and grace to top the field in both the one and the three meter springboard events. In a contest of over 30 divers per event representing over 33 teams from across the United States from as far East as Indiana. Ally has received an athletic scholarship for her diving and will be attending San Diego State University next year along with four of her graduating team mates from the Crown Valley Divers. In the 14-15 Boys division, Jake Greenberg, placed 2nd in the 3 meter contest and 3rd in the 1 meter. By finishing in the top 3 spots in their respective age groups, both Jake Greenberg and Ally Caplan have qualified for the USA Diving Junior National Diving Championships which will be held in knoxville Tennessee in July later this year. In the Team standings, Crown Valley Divers finished 2nd place in the girls division and 5th place overall in the combined men’s and women’s team points in this deep field of talented teams from across the country. Also contributing to this impressive team placement are Madeline Wiese finishing 4th on 3 meter and 7th on 1m meter in the 14-15 girls division, Charlotte Bowen, diving in the 12-13 age group, captured 4th place on 1 meter and 8th place on 3 meter, and Olivia Paquette, diving in the 11 and Under age group, finishing 6th place on 3 meter and 8th place on 1 meter. Crown Valley Divers had 41 divers travel last month to either Mesa, AZ or Elvaston, IL to compete in the regional competition with hope of qualifying for USA Diving West Nationals. There were many standout performances like Jake Greenberg and Madeline Wiese winning regional titles, and Ally Caplan and Olivia Paquette picking up some silver medals. Overall as a team CVD placed 2nd in Region 5 in Illinois and 4th in Region 9 in Arizona. Crown Valley Divers had 19 divers qualify and 17 are moving forward to the USA Diving West Nationals next month, April 25-27 in Riverside, CA. 11 and under: Krystia Mischel and Olivia Paquette. 12-13 Alex Besanceney, Charlotte Bowen, Katie LaBella, Nate Pellini, Erin Young. 14-15 Kaelyn Casazza, Jaclynn Fowler, Jake Greenberg, Madeline Wiese, Heather Yoshii. 16-18 Ally Caplan, Caleb Dixon, Chris LaBella, Lauren Pierce, Joey Winkler. Crown Valley Divers doubled as the Overall Team Champions and the Girls Team Champions for the 2013 AAU National Diving Championships in San Antonio Texas. Crown Valley Divers placed 2nd in the boys division with only 5 CVD boys participating. This is the second time in three years that Crown Valley Divers have captured the AAU National Diving Title. Among the terrific team effort that goes into winning any Overall National Title, there were several outstanding and notable individual performances including Olivia Paquette from Laguna Niguel defending her 2012 National Title on 3 meter for the 9 and Under Girls by topping the field with a score of 145.70, just ahead of her team mate Kaia Bray, also from Laguna Niguel, who placed second with a score of 112.55. Olivia captured the top spot in the 1 meter competition with a score of 135.05 and placed 4th in the 11 and Under platform event with a score of 135.85. Lauren Pierce, from Laguna Niguel and a student at Dana Hills High School, is also a double Gold Medal National Champion for her efforts on both 1 and 3 meter in the Girls 17 year old division with scores of 323.15 for 1 meter and 357.85 for 3 meter. In the Synchronized Diving events, for the Boys 13 and Under 3 meter event, the team of Nathan Pellini, from Dana Point, and Alexander Besanceney, residing in Laguna Niguel, captured the national title with a combined score of 134.13. Nathan and Alexander repeated this acheivment in the synchro 1 meter event as well with a score of 159.48, just ahead of their team mates James Fermelia, from Mission Viejo, and Sahil Das, from Laguna Beach, who finished second with a score of137.07. For the Girls 13 and Under 3 meter synchro event, Erin Young, from Dana Point, and Mackenzie Peasley, from Laguna Beach, took the top honors with a score of 124.11 with the team of Lillian Goodyear, from Dana Point, and Rachel Reeves, from Laguna Niguel, placing second with a score of 122.16. Erin Young and Mackenzie Peasley placed 3rd in the 3 and under 3 meter synchro event with a score of 131.01, with Lillian Goodyear and Rachel Reeves finishing 5th in the same event with a score of 122.04. Kaelyn Casazza, from Laguna Niguel, and Heather Yoshii, residing in Mission Viejo, captured the national title for the 14-15 Synchro 3 meter Girls event finishing with a score of 213.75. Other notable individual event finishes go to Erin Young who took 2nd place in the girls Group C 12 year old 3 meter event scoring 233.15 and 3rd in the 1 meter contest with a score of 210.45. Sara Kate Besanceney from Laguna Niguel placed 2nd in the Girls 10 year old 1 meter contest with a score of 160.40 and 3rd in the Girls 10 year old 3 meter contest with a score of 142.40. Sahil Das captured the Silver medal for his efforts in the Group D platform event with a score of 110.10. Adam Gross, from Coto De Caza, placed third in the 17 year old Boys 1 meter contest with a score of 374.00. Mackenzie Peasley from Laguna Beach took home the bronze medal for her efforts in the Girls 13 year old 1 meter contest scoring 213.15 and 3rd again in the Group C Girls Platform event with a score of 184.30. Alexander Besanceney finished 3rd in the Group C Boys platform event with a score of 182.85 followed by his team mate and successful synchro partner Nathan Pellini at 4th with a score of 159.00. 48 teams from across the United States participated in this prestigious National competition. Crown Valley Divers captured the 2013 AAU National Diving Championship Team Title by accumulating 585 combined boys and girls overall points. Alamo Area Divers from San Antonio Texas finished 2nd with 431 points. To Achieve the overall point total, Crown Valley Divers won the girls AAU National Diving title by amassing 412 points far outreaching 2nd place Glenbrook Aquatics Diving from Illinois with a total of 209 points. In the Boys division, Crown Valley Divers placed 2nd behind Alamo Area Aquatics Diving with a score of 173 to Alamo’s 257. Congratulations to all of the Crown Valley Divers, Their Coaches, and the Parents of these wonderful athletes. Crown Valley Divers hosted the USA Diving Spring Region 9 Championships on March 16-17, 2013. 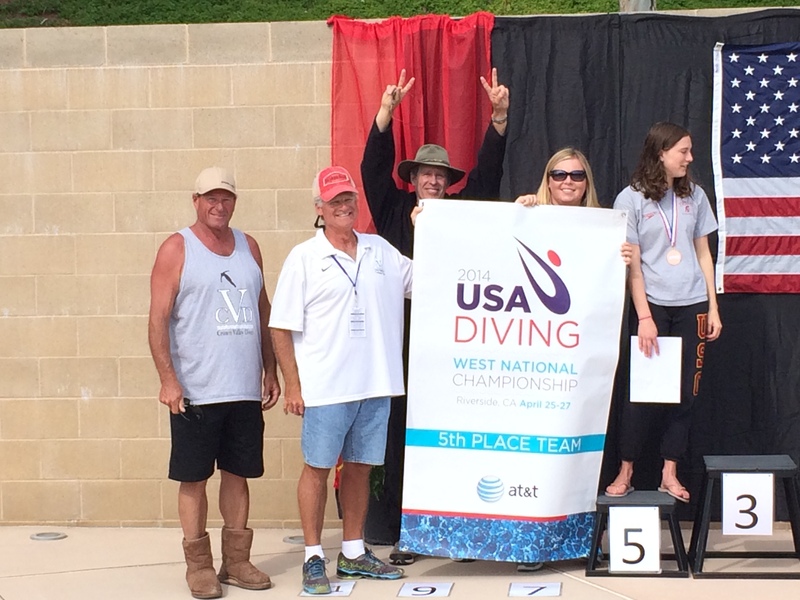 Region 9 was the largest attended region in the United States bringing 267 divers from Central and Southern California, Arizona, and Nevada to Laguna Niguel. The athletes competed for the top 6 coveted spots in their respective age group that would advance them to USA Diving West National Championships in San Antonio, Texas on April 12-14, 2013. The competition was difficult, over 60 girls competed in the 16-18 age group one meter event. The USA Diving West National Championships will have the top 30 divers in each age group west of the Mississippi river. Crown Valley Divers have 10 divers traveling to San Antonio this week to compete: Charlotte Bowen, Caitlyn Casper, Jaclynn Fowler, and Rhiannon Yanda 12-13 girls. Kaelyn Casazza 14-15 Girls. Caleb Dixon and Jake Greenberg 14-15 Boys. Ally Caplan and Makena Chamoures 16-18 Girls. Adam Gross 16-18 Boys. Head Coach Curt Wilson and Coach Dave Mickle will be traveling to Texas to lead the CVD team in this prestigious competition. Crown Valley Divers traveled up to Santa Clara, CA June 8-10 for the USA DIVING Junior Summer Region 10 Championships. This is the first step in qualifying for the USA Junior Summer Nationals. Over 250 divers were in attendance fighting for spots to Zone Championships in Riverside July 12-15. CVD has 30 divers qualified for Zones where they will try to place top 12 to continue onto Nationals. Region 10 was the largest in attendance than any year previous. Of the 16 teams competing including Stanford Divers, Santa Clara Divers, and Trojan Divers, Crown Valley Divers won first place team in overall team points. It was a head to head battle with Stanford Divers going into the third day of competition as they had the lead by 4 points. CVD had a great show of talent, strength, and grace earning them a total of 292 points at the end of the competition just ahead of Stanford Diving with 278. The coaching staff at Crown Valley Divers could not be more pleased with the teams performance in Santa Clara. We had a few standout performances by Caleb Dixon, Ally Caplan, Charlotte Bowen, and Madeline Wiese who all won Regional Champion Titles in their respective age groups. 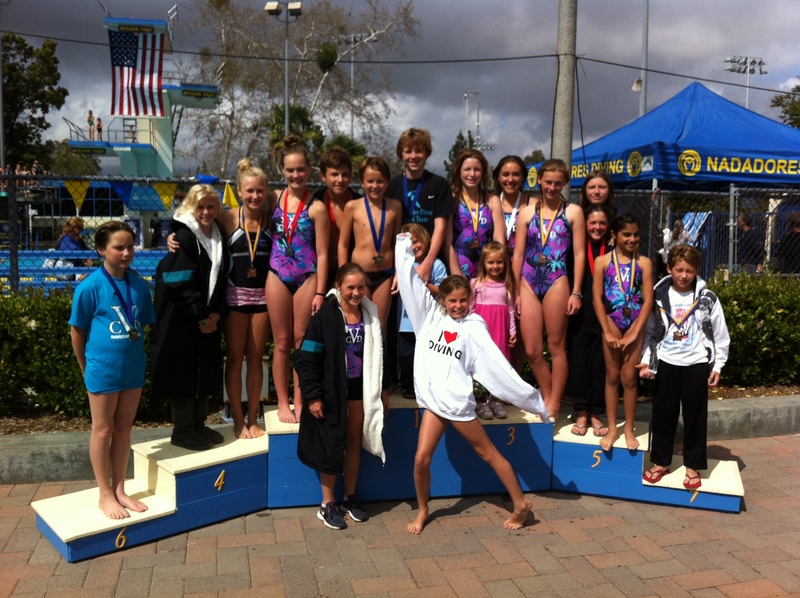 This is the start of a very exciting summer for the Crown Valley Divers of Laguna Niguel. The Crown Valley Divers did an amazing job at the MVND SoCal Invitational that took place this past Memorial Day weekend in Mission Viejo Ca. Some of the top scores were enough to qualify members of the team to AAU Nationals.